"How many of you want to go to Mars?" was the question posed to the large group of assembled engineers, scientists and other space professionals at a major aerospace event last week. Most hands in the audience shot up. The speaker was Bill Gerstenmaier, associate administrator for the Human Exploration and Operations Directorate at NASA Headquarters, and the meaning of his question was clear: People like Mars as an objective, and the human exploration of Mars is NASA's long-term goal. "We're building an approach that will allow humanity to move into the solar system, and Mars is the first destination," Gerstenmaier said. "We're building a plan and approach that uses the best in the private sector, the best internationally and what government can do, and puts that entire team together to build hardware and move forward in this vision." Gerstenmaier spoke at a plenary session at the American Institute of Aeronautics and Astronautics' (AIAA) SPACE 2016 meeting in Long Beach, California. 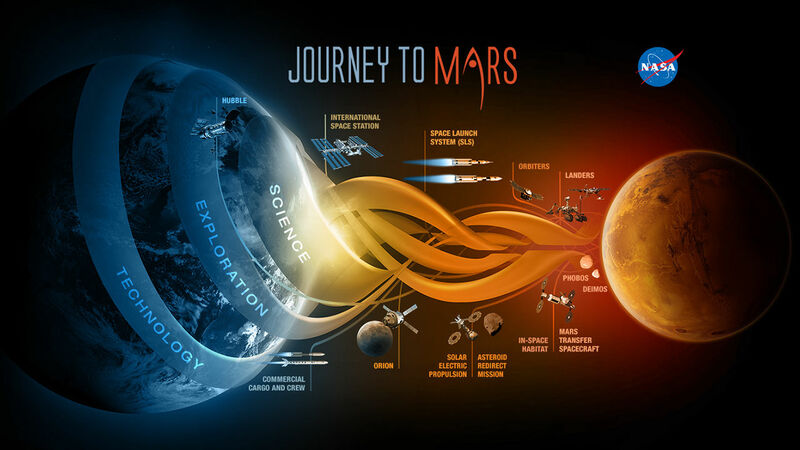 Gerstenmaier was joined by top executives from Lockheed Martin, Boeing, SpaceX and Aerojet Rocketdyne, along with representatives from NASA to discuss the long path to the Red Planet. At the center of NASA's grand vision for human Mars exploration are the agency's new megabooster rocket, the Space Launch System (SLS), and the Orion crew capsule (which are both currently under construction), as well as the International Space Station (ISS). NASA representatives have stated on multiple occasions that the agency considers the space station a valuable proving ground for the technologies and procedures that will be necessary to send humans to Mars. "We took life-support systems that we ran for years on the ground to [the] space station, and they worked for a week," Gerstenmaier said (meaning the systems failed after only a week of use). This story highlighted that NASA needs a space station where it can test technologies needed for long deep-space voyages, because ground tests aren't sufficient. Life-support systems will need improvement to be reliable enough to keep crews alive for months or years at a time. The importance of the space station in the journey to Mars was echoed by Michael Barratt, an astronaut and medical doctor who flew to the orbiting laboratory twice and continues to work on medical issues relevant to long-term weightlessness. "The human body in space is my passion," he said. During his talk, Barratt outlined some of the issues astronauts will face during extended voyages to Mars. "One of our big enemies has been musculoskeletal deconditioning," he said, referring to the decline in muscle mass and bone density thatastronauts experience in the absence of gravity. But Barratt followed this by discussing the progress made to ameliorate the condition. He cited rigorous resistive exercise and new pharmaceuticals as important steps toward preserving health in weightless conditions. "If you ask me 'Do we have a solution to provide health for a deep-space cruise phase to Mars?' The answer is yes," he said. "That wasn't true a few years ago, and [the ISS] has given us that." But not all the health challenges have been mastered, Barratt indicated. In the past five years, NASA has identified a new risk, called vision impairment and intracranial pressure, or VIIP, syndrome. After long stays in space, up to 90 percent of astronauts suffer problems with vision, including impaired focus, enlargement of the optic nerve, shifts in shape of the eyeball and changes in the structure of the retina. "This is one of the biggest physiologic discoveries in general, let alone in spaceflight," Barratt said. "We've been flying into space for 50 years, and we missed this," he added, and cited the space staton's importance in the discovery, with more findings likely to come from the station. And, he pointed out, with the station scheduled to be decommissioned in 2024, there is not a lot of time to understand and mitigate this and other ill effects that may still come to light. "The ISS is doing exactly what it was designed to do, so far as supporting exploration," he said. Next steps on the road to Mars, past the ISS, include living and working on or around the moon prior to the Martian trek. "A crew going to Mars will be more remote from Earth. They will be operating their own vehicle as opposed to having a mission control center that has real-time data," said John Elbon, the VP and general manager of space exploration for Boeing. "The crew will be the team. There's lots to learn, and going to the area around the moon is a good spot to do that." Gerstenmaier concurred. "We need to go someplace where we are days away from Earth," he said, referring to locations close to the moon (called cis-lunar space), where NASA can do "a lot of training and preparation." The major aerospace partners on ISS, SLS and Orion are developing plans for contributions to NASA’s objective of reaching Mars. Julie Van Kleek, who is in charge of rocket engine development at Aerojet Rocketdyne, discussed some of the new propulsion technologies she is working on to shorten flight times to Mars. Despite the development of reliable chemical rocket engines, such as those used to get the Apollo missions to the moon and back, she suggested that alternative propulsion technologies were where breakthroughs were most needed. Citing Aerojet Rocketdyne's 5-kilowatt Hall-effect thrusters (ion engines), which have been used for a number of uncrewed missions, she said that the company was considering options to increase the output of these engines to as much as 50 kilowatts. Van Kleek then expanded the conversation to include nuclear engines. "If you look at the benefits of nuclear thermal propulsion … with the advancements in materials and our ability to handle high temperatures … you can drastically reduce the trip time," Van Kleek said. Shorter transit times mean reduced demands on life-support systems and less exposure to radiation. Gerstenmaier discussed three broad outlines for Mars mission designs, each more challenging than its predecessor: a flyby of Mars, entering orbit (perhaps with an exploration of the Martian moons) and a landing on Mars. These may occur in sequence, or one option may be picked and focused upon. This is the advantage of NASA's so-called flexible approach: the ability to learn and make decisions as you go along, as Gerstenmaier put it. The aerospace companies are seeking roles in this efford, and are creating plans to be ready if and when NASA puts out the call for input. Lockheed Martin discussed its design for a Mars Base Camp earlier in the week, which would place a six-person habitat in Martian orbit sometime around 2028. The outpost would utilize solar-electric propulsion for its delivery, and would be close enough to the Martian moons Phobos and Deimos for astronauts to make sorties to the satellites. Guy Beutelschies, the director of space exploration systems for Lockheed Martin, stressed the continuing role of robotics in the exploration of the surface of the planet and its moons. "It's not robots or astronauts. Its astronauts and robots, working together," he said. "Astronauts will be operating robots on the surface, without that time delay that our controllers today have to struggle with" when working with rovers on Mars, for example. Gerstenmaier concluded by framing the Mars undertaking as a partnership of specialized strengths and capabilities. "This is an unbelievable challenge we have in front of us," he said. "We are not going to do this as a single nation or a single government. We will not do this as a single individual or a single corporation. We're going to take the absolute best from around the world … then we can accomplish this goal."